I’ve always been a fan of the more complex flavors in baking, but there is something to be said for the classics. 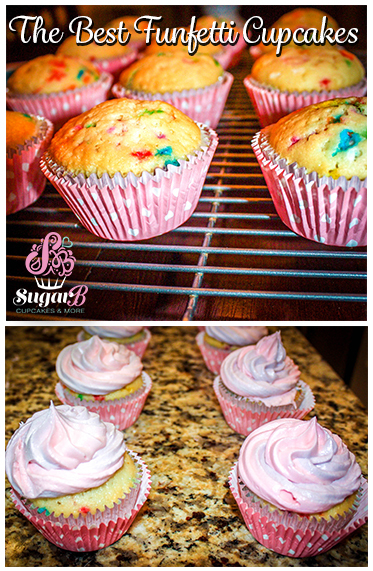 This funfetti recipe is one of my absolute favorites! It’s made from scratch and comes out moist and delicious every time. The batter is so good, it’s almost hard to actually bake the cupcakes… because I could probably just eat the entire bowl of batter off a spatula and be content. I’ve made these a few times recently for various birthday parties and they are definitely a hit. The frosting is a classic medium/soft buttercream, ideal for decorating. If you are attempting more complex cupcake decorations, you can always add additional powdered sugar to stiffen the frosting more. The party I made these particular cupcakes for was Doc McStuffins themed – so pink and purple was very fitting. I’ll also have a post soon for the cake from this party, White Almond Sour Cream Cake (and yes, it is SO delicious). Remember to always make your cupcakes and cakes several days (up to a week) in advance and freeze them. 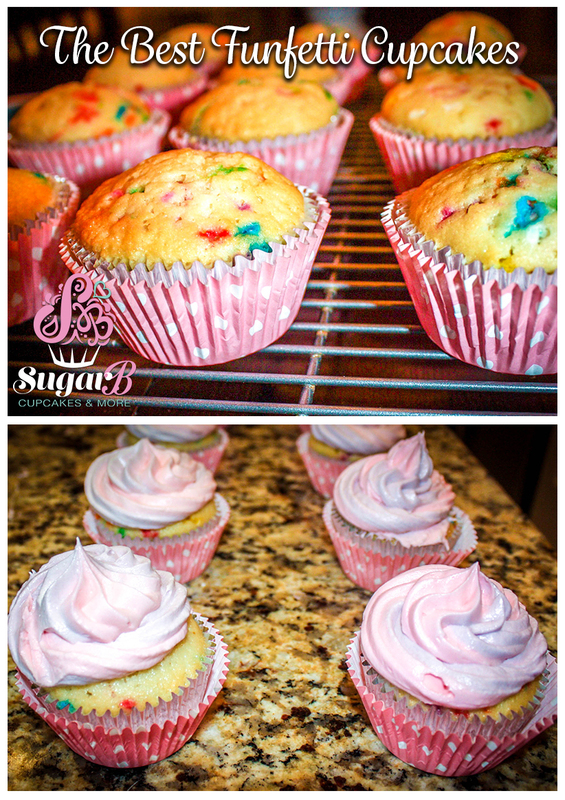 This easy step allows the cupcakes to lock in moisture and makes frosting the cakes easier! Preheat oven to 350 degrees (F). Place liners in cupcake pan and set aside. Melt 1 stick of butter in a microwave-safe bowl and heat on low for 20 seconds, stir, and heat again, repeating this process until the butter is completely melted. Allow the melted butter to cool for a minute or two, then whisk in the 1c sugar and 1/2T vanilla, beating well. Add in the 2 eggs, one at a time, beating well after each addition. Fold in the 1/4c whole milk and 1/4c vanilla yogurt. Add the 1 1/2c flour to the wet mixture and before stirring top the flour with the 1 1/4t baking powder and 1/2t salt; using a small fork gently mix the dry ingredients together on top of the wet ingredients, then – using a rubber spatula – fold the dry ingredients into the mixture, stirring just until combined. Fold in 1/2c sprinkles as the final step. 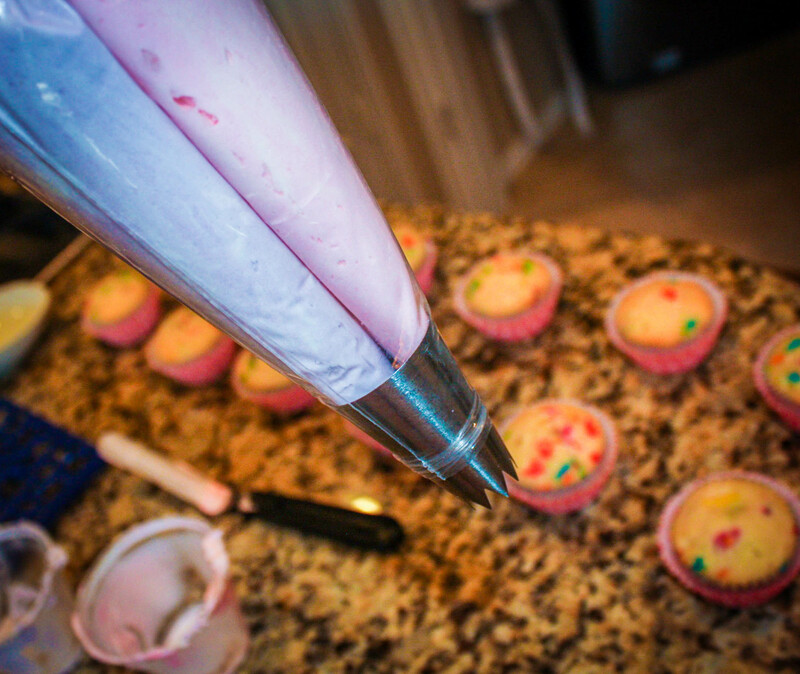 Spoon batter into cupcake liners (filling each cup about 2/3 full) and bake for 18-20 minutes, or until a cake tester inserted in the center of the cupcake comes out clean. Allow cupcakes to cool on baking rack. If time allows, freeze the cupcakes by wrapping in seran wrap followed by aluminum foil. You will want to pull them out of the freezer about 24 hours before they are to be served, frost them and refrigerate! 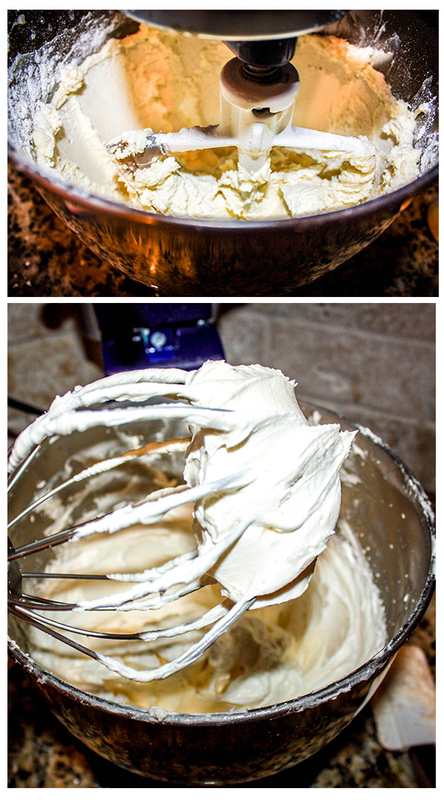 In a stand mixer using the paddle attachment, cream 1/4c shortening and 1/4c butter until fluffy. Sift the 2c powdered sugar then add sugar, 1/2 cup at a time, mixing a bit between each addition. Make sure to slowly mix in sugar to keep it from flying everywhere, I prefer to pulse the mixer a few times before letting it stay on low. Continue creaming until well blended. Add 1/8t salt, 1/2t vanilla, and 1 1/2 oz heavy whipping cream. Blend on low speed until moistened. Beat at high speed until frosting is fluffy, 1-2 minutes. I made a fun split frosting color for my batch, which requires two frosting bags set into another frosting bag with the tip attached. It creates a beautiful result! Now, simply eat and enjoy (which is always my favorite part)!